When moving to the Cloud companies run into “Day 2 problems”. The technology, interfaces and how to use all the stuff are super easy however on the second day comes the real challenge: How to use all this great stuff in a structured way on company/enterprise level? Here is a great read on “Day 2 problems in the Cloud“. Day 2 is a management problem, not a technology problem. Adoption and implementation require different skill sets, than innovation. These have to be put to work. This entry was posted in Architecture, Reading, Tools and tagged Architecture, Cloud, Integration, Patterns, process, Productivity, software development on 2018/01/26 by PeterPaul. 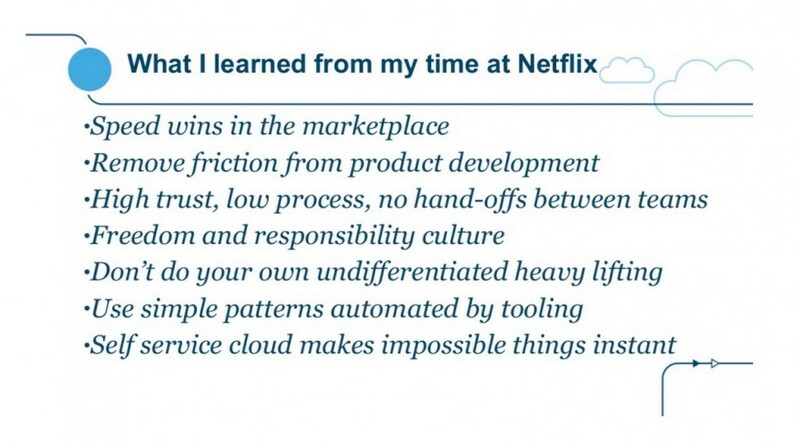 Just a month after sharing my post on Spotify engineering culture, I found a post on Startup lessons from Netflix. That was written inspired by a talk on fast delivery devops by Adrian Cockcroft. Who spent a long time building up Netflix’s cloud infrastructure and spearheaded the development of many new cloud-related technologies and techniques at the company. This entry was posted in Agile, Architecture, Lean, Reading and tagged Agile, Cloud, Lean, Netflix, scrum, web on 2014/11/10 by PeterPaul. The Cloud — The Cloud, in various manifestations has been ranked No. 1 for 2008, No, 4 overall for the decade, and now as No. 2 for 2012. Still all very nebulous. The Most Confusing Tech Acronym of 2012: SOA (Solutions Oriented Architecture), continuing its Most Confusing Tech Acronym of the Decade reign. Read the full version on The Global Language Monitor. This entry was posted in Architecture, Life hack, Tools and tagged Architecture, Big data, Cloud, SOA on 2012/03/19 by PeterPaul. The world’s largest conference dedicated to SOA, cloud computing and service technology will have it’s 2012 version in London! Hosting the 5th SOA Symposium and the 4th International Cloud Computing Symposium on September 24-25. This brings the symposium back to Europe after last years visit to Brasilia, Brazil. The SOA Symposiums website has been rebranded to Service Tech Symposium. Additional information the 2012 SOA Symposium Call for Papers are available online. Download the Speaker Form. All submissions must be reviewed no later than July 15, 2012. This entry was posted in Architecture, Service Orientation and tagged Cloud, Erl, Service, SOA, SOASymposium on 2012/03/19 by PeterPaul. Oracle released the Oracle Enterprise Manager Cloud Administration Guide 12c Release 1 (12.1.0.1) documentation. It is part of the Enterprise Manager Cloud Control Documentation. Enterprise Manager Cloud Control is system management software that delivers centralized monitoring, administration, and life-cycle management functionality for the complete IT infrastructure, including systems running Oracle and non-Oracle technologies. This entry was posted in Oracle, Release, Tools and tagged 12c, Cloud, EM, Oracle, Release on 2012/02/01 by PeterPaul. Our code is living increasingly in ecosystems. Many PHP programmers, for instance, create plug-ins for WordPress, Drupal, Joomla, or some other framework. Their code is a module that works with other modules. The same goes for development for mobile devices that rely increasingly on modules or apps created by others, whether they run on the device or in the cloud. This increases the demand for stable interfaces and contracts. Besides that the requirements for availability and scalability will weigh in heavier. Or create programs that deliver value in an efficient way. 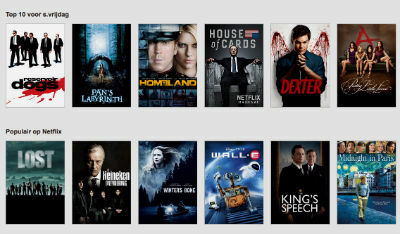 New releases of software programmers tend to demand always more resources (just a small example). The cost of keeping a computer plugged in has never been an issue. It never mattered how much energy your rack of servers sucked down because the colo just sent you a flat bill for each box. The Cloud trend tends to make cost more transparent. Some of the clouds — like Google App Engine or Amazon S3 (example) — don’t bill by the rack or root password. They charge for database commits and queries. This adds a new perspective for software developers. We might need to start thinking about the cost of each subroutine in euros, not in lines of code, function points or milliseconds of execution time. On the consumer side more and more ISPs adding bandwidth caps and metering. To a software developer this means that optimizing bandwidth consumption when designing apps is becoming imperative. Besides the cost issue this will also be needed because of the customer experience (loading speed etc). This entry was posted in Lean, Open Source, Tools and tagged Cloud, Code, Integration, Lean, Software, Tools on 2012/01/17 by PeterPaul. Earlier this month a talk by Thomas Erl (bestseller author on SOA and Cloud Computing) on SOA, Cloud Computing and Semantic Web technologies became available on the Arcitura Youtube channel. This talk gives a less than 30 minutes overview in how these work together. It has a focus on highlight promissing areas of synergy. Cloud computing is a specialized form of distributed computing that introduces utilization models for remotely provisioning scalable and measured IT resources. Semantic Web Technologies represents a technology platform used to describe artifacts, their properties, and their relationships using machine-processable language. This entry was posted in Architecture and tagged Architecture, Cloud, Erl, Semantic Web, Video, web on 2011/11/16 by PeterPaul. Given the location simultaneous translation (English-Portuguese-English) will be available in all technical sessions. For the complete agenda or resources from previous conference, check the site. Videos from the 2010 edition of the SOA Symposium can be found on InfoQ. This entry was posted in Architecture, Service Orientation and tagged Architecture, Cloud, Erl, Service Orientation, SOASymposium on 2011/04/07 by PeterPaul. an introduction to cloud computing pointing to the fact that the middleware needs of the cloud are similar to SOA’s, showing some of the benefits of running SOA along with the cloud, asking if cloud computing and SOA should evolve together and giving some future directions to consider. how to design a BPM/SOA solution including: modeling human interaction, improving BPM models, orchestrating composed services, central task management, new approaches for business-IT alignment, solutions for non-deterministic processes, and choreography. believes organizations need SOA more than before, but using a redefined SOA based on the SOA Manifesto, focusing on models, methodologies and patterns, not on technology, intended to produce the desired business and technical goals. For a complete overview of SOA Symposium sessions on InfoQ check their SOA Symposium page. This entry was posted in Architecture, Release, Service Orientation and tagged Architecture, BPM, Cloud, Erl, ESB, InfoQ, Integration, Service Orientation, SOA, SOASymposium on 2010/11/22 by PeterPaul.